Thousands of pages of South Bend related print matter (most of it generously provided at great expense from the Lindell V. Riddle Personal Collection) has been scanned and online free to the world! More material is still being scanned and going on-line! Tons of catalogs, bunches of advertisements and scads of miscellany. Print 'em out if you like or download the files for your own handy reference. All images have been scanned at a reasonably high resolution so that they are printable and readable. CLICK THESE WORDS FOR: South Bend Catalogs and Literature <<< Click for listings page and downloads! 1909 SB Watch Catalog "A" 61 pgs. 1913 SB Catalog "Jewelers Confidential Price List" 24 pgs. 1914 SB Catalog "How and Why to Own a South Bend Watch" 72 pgs. 1916 SB Catalog "Jewelers Confidential Price List" 30 pgs. 1925 SB Watch Catalog "Lifetime Accuracy" 16 pgs. c.1924 The Making of a Marvelous Mechanism! 1971 Paul Berg's "The Studebakers and the South Bend Watch Co."
1985 Dr. O.B. Frye's "South Bend Watches"
1988 Dr. O.B. Frye's "The Jesse E. Coleman Story"
2000 Ueberall and Singer "The Railroader's Corner"
Remember, all South-Bend dates and numbers are approximations, there are no precise records in existance. 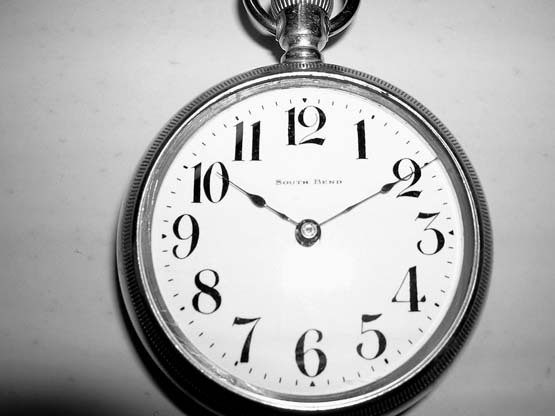 A plea to all South Bend and Pocketwatch collectors! If you have a South Bend watch please send us the Movement Number and Case Number to add to our database at ihc185@roadrunner.com Also, any pictures or advertisement material would be appreciated. If you would like to volunteer to work on or assist in this project please contact ihc185@roadrunner.com so we can discuss your participation. Many thanks to Orville Hagans, Jesse Coleman, Paul Berg, Dr. Owen B. Frye, Ed Ueberall, George Reitenour, Jeff Tibbs and especially Lindell V. Riddle without whose work, research, contributions and encouragement this research resource would never have been be possible. Thank you! Thank you VERY MUCH for all your work in making the info available. I especially like the "watch movement manufacture" article. Has anyone come up with anymore South Bend printed material that isn't included in our listings? Any additional info/data is appreciated, including pictures of watches in your collection. Just post the pics in this forum. Also, anyone that has a South Bend pocket watch in their collection, please post a topic on it here or send us the movement number and any other info you might be willing to share. If you prefer, info can be kept confidential as to source. Thanks for that picture and serial number! I understand you have numbers 534279 and 534690. I have # 534117 but that is a marked 345. Hrm... the mystery continues. Here is a pic of the rather odd looking dial Keith sent in. Anyone have an idea of what movement it might hold? The above watch is a Grade 304. A very rare watch that is a hunting movement converted to a secondless OF. IHC 185 is an amazing place. On the membership roster we have Dr. O.B. Frye, who when working with material left behind by Jesse Coleman, W.C. Shelton and Orville Hagans, combined with his own extensive knowledge of the South Bend watch company, wrote two "Bulletin" articles ( Dec. 1985 #239 and Feb. 1988 #252 ) for SB collectors. I've talked with many long-time collectors who still carry that article with them to regionals and other shows as their reference material. Dr. Frye's article was instrumental in raising awareness of the truly nice work that the South Bend Watch Co. did and it's rightful place among the other quality manufacturers of the time such as Hamilton, Rockford, Illinois Hampden, Elgin and Waltham ). And then last, but not certainly not in anyway the least, we have George Reitenour and of course Lindell Riddle. George is a descendant of Clement Studebaker and has a wealth of knowledge concerning all the Studebaker companies, not just the watch side. I've had the privilege of talking with George and Lindell about the history of the company and their highly entertaining anecdotal knowledge. George sent us some of the material that is in the South Bend Literature and for that we owe him many thanks. Lindell started out as a collector and enthusiast of Studebaker cars and their history then evolved to researching and collecting Studebaker and South-Bend Watches (he must have thought it might take up less space! ). Lindell, being a quick study, after a few years had enough research, insight and new data to write his groundbreaking "HISTORY OF SOUTH-BEND WATCHES" in 2002 which more than anything else re-ignited interest in the company and their watches. That great article also helped clear up many of the previous misconceptions and misinformation that had previously become gospel. Most importantly, Lindell's article gave newcomers (and old-timers) a clear and concise explanation of all the different phases of the company and the differences between the watches produced. Lindell relied heavily on new information that he had diligently unearthed in the fifteen years since Dr. Frye's articles. We at IHC 185 are lucky to have many of the foremost experts, researchers, enthusiasts and collectors of South Bend Watches all right here in the same chapter. It makes me very happy to belong to such a chapter. 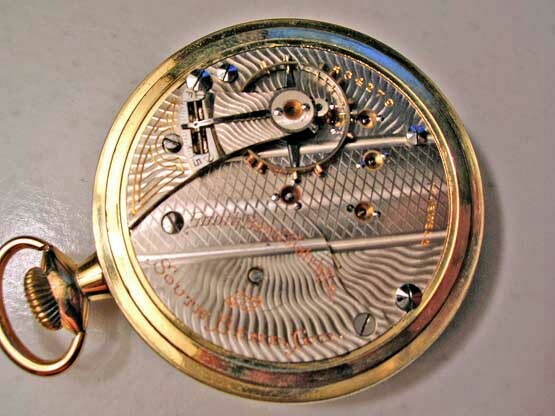 In addition, at IHC 185, the HUGE wealth of knowledge represented by chapter members concerning other watch companies and different aspects of watch and clock making is astounding and barely believable. The way Lindell set it up, it's almost like having Henry Fried, Don DeCarle, Orville Hagans, C.T. Higginbotham and Roy Earhardt all in the same room answering questions! Barely a day goes past when I don't learn something new about this hobby from IHC 185 participation. A big thanks to all! Lighting does strike twice! I have found a second one of theses no seconds bit dials. This one does not have any dial feet. But it is a nice dial. It is on the proper 304 movement #730800. That's amazing. Two 304's. Could you take a good picture of the movement? I'm missing one for the database. I also have this 304 which is finished as a hunter style watch (number 730160). This early serial number has a different Damaskeenig pattern then the other two later ones (numbers 730800 and 730964). Frank: Great job on updating the webpages. The watch grade guide is superb! This is a really fantastic resource. I find myself spending way to much time reading through these catalogs. All of the South Bend material is a present from Internet Horology Club to the world of horology. It is FREE knowledge. You can do absolutely anything with it except use it to break the law. You can copy the structure (hah!) or you can download all the .gifs and put them it a binder for your own use. We are glad that you are enjoying it. What happened to the Serial Number Database? 759551-760000,429,0,2,19,450,1912, Check Against Database for Grade 120's.